With bright fluorescent lights, flashy colours and countless catchy slogans and broad claims, buying groceries can be pretty jarring. Even more so when we consider that those eye-catching packages are destined to end up in the landfill. Is it necessary for our foods to be so loud, or could the future of packaging be a store itself? 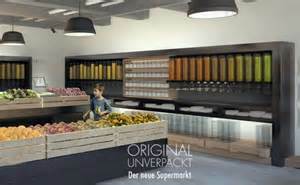 That’s the idea behind Original Unpacked (Original Unverpackt), a supermarket concept that wants to cut down on waste and confusion by adding transparency to our shopping list. Instead of the product packaging free-for-all we have now, where each aisle is a barrage of facts and fictions all vying for our trust, Original Unpacked would carefully choose and test each item they offer and present them as they are. Shoppers would be asked to bring their own containers to refill from bulk-bins, produce shelves or an electric filling station for beverages, where product information, including nutritional information and origins, are clearly labelled. Not only could this cut down on package pollution, but also on food waste. A business model like this could allow more control in ordering realistic quantities based on demand. While the minimalist design in the Original Unpacked concept art communicates a sort of high-end food co-op feel, not all of the products available will be necessarily organic. In addition to the creator’s desire that their stores be a resource for shoppers on any budget, the focus will be on local items and those that already have little packaging. Milena Glimbovski and Sara Wolf, the creators of Original Unpacked, have been working on their business plan since November 2012. Now, after just a few days on startnext, a German crowdfunding site, they’ve secured € 88,457, nearly doubling their target of € 45,000 and there’s still 26 days left to pledge. Tags: crowdfunding, Food, Milena Glimbovski, Original Unpacked, Original Unverpackt, packaging, Sara Wolf, startnext, supermarket. Bookmark the permalink.